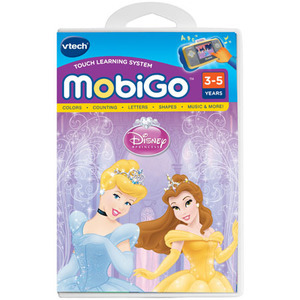 Cinderella and Belle enjoy helping their friends and love to learn in this game for the MobiGo Touch Learning System from VTech. Girls can aid their favorite Princess with making clothes fixing jewlery finishing words in enchanted books and so much more. For kids ages 3-5 years your preschooler can play with their favorite electronic learning toy and will learn core school skills to help prepare them for years to come including colors numbers shapes patterns and counting! Each Princess is featured in three games that teach numbers colors shapes letters and more!